This is a draft (July 28, 2005) of Chapter VII of The Emotion Machine by Marvin Minsky. Do not distribute, because it will change, but please send comments to minsky@media.mit.edu. Which characteristics help us to surpass all the rest of our animal relatives? Surely our most outstanding such trait is our knack for inventing new Ways to Think. Romanticist: You claim that our finest distinction is thinkingвЂ”yet perhaps we are even more unique in our richness of how we experience things. ThereвЂ™s the joy of turning oneвЂ™s intellect off, to enjoy a sunset or listen to birds, or to sing or do a spontaneous dance in delight of the sense of being alive. Determinist: People use words like вЂ�spontaneousвЂ™ to make themselves feel that they arenвЂ™t constrained. But perhaps that sense of enjoying ourselves is merely a trick that some parts of our brains use to make us do what they want us to do. In any case, I doubt that we ever stop thinking entirely, because thinking refers, at different times, to a huge range of intricate processes. Citizen: If our everyday thinking is so complex, then why does it seem so straightforward to us? If its machinery is so intricate, how could we be unaware of this? That illusion of simplicity comes from forgetting our infancies, in which we grew those abilities. As children we learned how to pick up blocks and arrange them into rows and stacks. Then as each new group of skills matured, we built yet more resources on topвЂ”just as we learned to plan and build more elaborate arches and towers. Along with this, in those early times, we assembled the towers of aptitudes that we describe with words like minds. But now, as adults, we all believe that we have always been able to thinkвЂ”because we learned those skills so long ago that we cannot recall having learned them at all. It took each of us many years of hard work to develop our more mature ways to thinkвЂ”but whatever records remain of this have somehow become inaccessible. What could have made us all victims to that вЂњamnesia of infancy?вЂќ I donвЂ™t think this is simply because we вЂ�forgot.вЂ™ Instead, I suspect that itвЂ™s largely because we kept developing new, better techniques for representing both physical and mental eventsвЂ”and some of these methods became so effective that we abandoned the use of our previous ones. Now, even if those old records still exist, we no longer can make any sense of them. In any case, the result of this is that now we all think without knowing how we thinkвЂ”and we do it so fluently that we scarcely ever ask about what thinking it is and how it might work. In particular, we like to celebrate grand accomplishments in the sciences, arts, and humanitiesвЂ”but we rarely applaudвЂ”or ask questions aboutвЂ”the marvels of everyday, commonsense thought. Indeed, we often see thinking as more or less passive, as though our thoughts just вЂњcome to usвЂќ and we say things like, "It occurred to me" or вЂќA thought entered my mind,вЂќ instead of, вЂњI just made a new idea.вЂќ Thus we talk as though we donвЂ™t deserve any credit for our ideas, and we scarcely ever wonder about what chooses which subjects we think about. One of the wooden doors in my home bears scratches made more than a decade ago. Our dog Jenny is gone but the scratches remain. I notice them only a few times a year, though I pass by that door several times every day. Every day you encounter great numbers of things, yet only a few of them вЂ�get your attentionвЂ™ enough to make you ask questions like, вЂњWhat is that object and why is it here,вЂќ or вЂњWho or what caused that to happen? Most times your thinking proceeds in a smooth, steady flow in which you scarcely ever reflect on how you get from each step to the next. However, there are certain times when your thinking is much more aim and direction. This happens when you are pursuing a certain goal, but encounter an impasse or obstacle like, вЂњI canвЂ™t pack all this into this boxвЂ”and besides, that would make it too heavy to lift.вЂќ Then you may stop to deliberate: вЂњIt looks like this will take several trips, but I donвЂ™t want to spend that much time on this.вЂќ Much of this chapter will discuss the idea that such recognitions of obstacles play critical roles in controlling our higher levels of thinking. This chapter will develop the idea that each person has many different ways to think. One could ask why we have so many of those, and one answer would be that our ancestors lived through a host of varied environments, each of which required ways to deal with different conditions and constraints. Then, because we never discovered one uniform scheme that could meet all our needs, we retained large parts of that collection of methods for coping with different situations. Generally, we do not seem to be much aware of switching among all those ways to think. Perhaps this in large part because we all have that sense of having (or being) a Single SelfвЂ”so one rarely asks a question like, вЂњWhat prevents any part of my mind from seizing control of all the rest?вЂќ (Such accidents must have happened to many individuals in the course of human historyвЂ”but their genes failed to propagate because they lacked enough versatility.) The result was that, over eons of time, our brains evolved a good many different ways to avoid the most common kinds of mistakes, while still staying able to adapt to a series of new environment; this is how evolution works; each species evolve at the edge of some zone between the safeties they know and the dangers they donвЂ™t. Psychiatrist: That safety-zone can be narrow indeed. Most of the time, most minds function well, but sometimes get into various states in which they can scarcely function at allвЂ”and then we say that theyвЂ™re mentally ill.
Physiologist: Surely most such disorders have medical causesвЂ”such as traumatic injuries, or chemical imbalances, or diseases that damage our synapses. Programmer: Perhaps, but we should not assume that all such disorders have non-mental causes. When a вЂ�software virusвЂ™ infects a computer and changes some data on which it programs depends, the hardware is not damaged at all, but still there are serious changes in how it behaves. Similarly, a new destructive goal or ideaвЂ”or a change in oneвЂ™s Critics or Ways to ThinkвЂ”could gain control of so much of a personвЂ™s resources and time that it could affect multiple realms of knowledge and thoughtвЂ”and thus spread like a mental malignancy. Sociologist: Perhaps itвЂ™s the same on a larger scale, when the notions of a sect or cult include ways to discern potential recruits, in whom its ideas and belief will propagate. В§7-1. What selects the subjects we think about? Joan needs to write a project report, but has not made much progress on it. Discouraged, she sets those thoughts aside and finds herself roaming about her house with no particular goal. She passes an untidy stack of books, and stops for a moment to straighten them out. But then she вЂ�getsвЂ™ a new idea, so she goes to her desk to type a note. She starts to typeвЂ”but finds that the вЂ�TвЂ™ on her keyboard is stuck. She knows how to fix this, but worries that, then, she might forget that new ideaвЂ”so, instead, she makes a handwritten note. What led Joan to notice that pile of books? Why did that that idea вЂ�occurвЂ™ to her now, instead of at some other time? LetвЂ™s look more closely at these events. Discouraged, Joan sets those thoughts aside. When and how will she bring them back? That will depend on the extent to which she can later find records of them. Section В§7-9 will ask about how we remember the contexts of our recent thoughts. Joan is roaming without any goal. Or so it may seemвЂ”but most animals have instincts to maintain their вЂ�territoriesвЂ™ or nests. Joan usually walks right past that spot without giving it a second thoughtвЂ”but perhaps right now she is вЂ�making roundsвЂ™ because she is mainly controlled by Critics that aim to maintain the tidiness of her home. She passes an untidy stack of books, and stops for a moment to straighten them out. Why doesnвЂ™t Joan stop now to read those books, instead of just trying to tidy them up? Perhaps this is because the Critics that are most active now represents those books as untidy objects (rather than as containers of knowledge)вЂ”so sheвЂ™s more concerned with how they look than with the subjects that they are about. But then she вЂ�getsвЂ™ a new idea. When people say, вЂњIt occurred to me,вЂќ this show how limited is the extent to which we can reflect on how we produce our ideas. Joan goes to her desk to type a note. Joan knows that when she вЂњgetsвЂќ an idea, she cannot depend on remembering itвЂ”and so she puts her housekeeping on hold to make a more permanent record. She finds that the вЂ�TвЂ™ on her keyboard is stuck. She knows how to fix this, but worries that then she might forget that new idea. She is using her self-reflective knowledge about the qualities of her short-term memories. What schedules our large-scale plans? What reminds us of things that we promised to do? How do we choose among conflicting goals? What decides when we should quit or persist? Any good model of commonsense thinking should suggest some answers to questions like these. However, so long as everything goes well, your thoughts seem to proceed in a steady, smooth flow. Each minor obstacle makes only small changes in how you think, and if you вЂ�noticeвЂ™ these at all, they merely appear as transient feelings or as fleeting ideas. However, when more serious obstacles persist and keep you from making progress, then, various Critics intervene to make larger changes in how you think. Most of the time your thinking proceeds in routine, uneventful streamsвЂ”but sometimes you run into obstacles that interrupt your orderly progress. Then youвЂ™ll have to find something else to do, and this may lead to a spreading cascade changes in the way you think. Changing the subject. Whatever you are doing now, there are always other things you could do, so whenever you get discouraged with one, you might want to switch to another. Self-Conscious Reflection. If that doesnвЂ™t work, you might start to imagine how you (or your imprimers) would feel if your performance conflicted with your ideals. Self-Regression: When your situation seems to become so complex that you see no way to deal with it, you still can ask yourself, вЂњHow did I deal with such things in the past?вЂќ Then you may be able to вЂ�regressвЂ™ to some earlier version of yourself, from an age when such things seemed simpler to you. Cry for Help! If you canвЂ™t find a way to do something yourself, you might attempt to exploit the resources of your friends. As infants, we were designed to do this, using signals that hijack more powerful minds. Emotional thinking: A flash of impatience or anger can cut through what seems like a hopelessly tangled knot. Each such вЂ�emotional way to think' is a different way to deal with things, and some can increase your persistence or courage, while others can help you simplify things. In any case, after each such change, you may still want to pursue some similar goals, but now youвЂ™ll see them from new points of viewвЂ” because each switch to a new Way to Think may initiate a large-scale cascade. Then, depending on how long those changes persist, you (or your friends) might recognize this as a change in your emotional state. Various parts of our states of mind can continue for different scales of time. Some last for no more than the blink of an eye, but infatuations persist for days or weeks. However, when other вЂ�dispositionsвЂ™ endure for substantial spans of a individualвЂ™s life, we see as aspects of that personвЂ™s personality,вЂ™ and we call these characteristics or traits. For example, when solving a problem, some people tend to accept a solution that still has some deficienciesвЂ”so long as it seems to work well enough: you might describe such a person as realistic, pragmatic, or practical. Another person may tend to insist that every potential flaw must be fixedвЂ”and you might call such people fastidiousвЂ”except when they make you uncomfortable, in which case you call them obsessive instead. Other such dispositions include being Cautious vs. Reckless, Inattentive vs. Vigilant, Unfriendly vs. Amicable, Reclusive vs. Sociable, Visionary vs. Down-to-Earth, or Courageous vs. Cowardly. In fact, in the course of everyday thought, each person is likely to frequently switch among such views or attitudes, and we usually donвЂ™t even notice this. However, when we encounter more serious trouble, our Critics may make enough changes to start the large-scale cascades that we describe in terms of emotional states. Psychiatrist: What would happen if too many Critics were active? Then your emotions would keep changing too quickly. And if those Critics stopped working at all, then youвЂ™d get stuck in just one of those states. Perhaps we can see an example of this in Antonio R. DamasioвЂ™s book, DescartesвЂ™ Error,  which describes a patient named Elliot, who had lost some parts of his frontal lobes in the course of removing a tumor. After that treatment, he still seemed intelligentвЂ”but his friends and employers had the sense that Elliott was вЂ�no longer himself.вЂ™ For example, if asked to sort some documents, he was likely to spend an entire day at carefully reading just one of those papersвЂ”or at trying to decide whether to classify them by nameвЂ”or by subject or size or date or by weight. The damaged parts of ElliotвЂ™s brain included certain connections (to the amygdala) that are widely believed to be involved with how we control our emotions. This led Damasio to suggest that вЂњreduced emotion and feeling might play a role in Elliot's decisionвЂ“making failures.вЂќ However, we could also consider this opposite view: that it was Elliot's new inability to make such decisions that reduced his range of emotions and feelings. For, perhaps the damage in Elliott's brain was mainly to some of the Critics (or to their connections) that formerly set off the large-scale cascades that we recognize as emotional states. Then he would have lost those precious cascadesвЂ”and hence, the emotions that he once displayedвЂ”because he could no longer could exploit those Critics to choose which emotional states to use. We frequently change what weвЂ™re thinking about, without noticing that we are doing thisвЂ”because it is mainly when some trouble comes that we start to reflect about thinking itself. Thus, we donвЂ™t recognize a problem as вЂ�hardвЂ™ until weвЂ™ve spent some time on it without making any significant progress. Even then, if that problem does not seem important, you might just abandon that line of thought and simply turn to some other subject. On the left are resources that we shall call Critics, each of which can recognize a certain species of вЂњProblem-Type.вЂќ When a Critic sees enough evidence that you now are facing its type of problem, then that Critic will try to activate a вЂњWay to ThinkвЂќ that may be useful in this situation. If a problem seems familiar, try reasoning by Analogy. If it seems unfamiliar, change how youвЂ™re describing it. If it still seems too difficult, divide it into several parts. If it seems too complex, replace it by a simpler one. If no other method works, ask another person for help. Every person accumulates a collection of different вЂњWays to ThinkвЂќ because, as weвЂ™ve repeated many times, no single method or mental technique can solve every kind of problem-type; however, if we have enough of them then, whenever the one weвЂ™re using fails, weвЂ™ll be able to switch to a different one. If too many Critics are aroused, then describe the problem in more detail. If too few Critics are aroused, then make the description more abstract. If important resources conflict, then try to discover a cause for this. If there has been a series of failures, then switch to a different set of Critics. I selected a hard-to-use method, but realized that I knew a simpler yet better one. I now see that the action I took had a bad, irreversible side effect. I regarded that as an obstacle, but now I see that it was valuable. Although that method caused some trouble, I learned a lot from using it. The following sections will discuss some of our many Ways to Think, and some of the Critics we use to recognize various ways in which we get stuck. It is mainly when we get into trouble that we engage the processes that we call thinking or reasoning. However, вЂ�thinkingвЂ™ is no single, definite thing; instead, we use different вЂ�Ways to ThinkвЂ™ for dealing with different types of obstacles. It ought to be one of our central goalsвЂ”both for AI and for PsychologyвЂ”to classify our Ways to Think. However, we donвЂ™t yet have systematic ways to classify those abilitiesвЂ”so IвЂ™ll just list some examples of them. Knowing How: The best way to solve a problem is to know how to solve it and use that solution. However, we may not know how to retrieve what we know, or even know that we know it. Extensive Search. When one knows no better alternative, one could search through all possible chains of actionsвЂ”but this is usually impractical because that search grows exponentially. Reasoning by Analogy: When a problem reminds you of one that you solved in the past, you may be able to adapt that case to the present situationвЂ”if you have good ways to tell which similarities are most relevant. Divide and Conquer. If you canвЂ™t solve a problem all at once, then break it down into smaller parts. For example, every difference we recognize may suggest a separate sub-problem to solve. Planning. Consider the set of sub-goals you want to achieve and examine how they affect each other. Then, with those constraints in mind, propose an efficient sequence for achieving them. Simplification. Sometimes, a good way to make a plan is to make a simplified problem by ignoring some aspects of the original one. Then any solution to the simplified one may serve as a sequence of stepping-stones for solving the initial problem. Elevation. If you are bogged down in too many details, describe the situation in more general terms. But if your description seems too vague, switch to one that is more concrete. Reformulation. Find a different representation that highlights more relevant information. We often do this by making a verbal descriptionвЂ”and then вЂ�understandingвЂ™ it in some different way! Self-reflection. Instead of pursuing a problem itself, ask what makes that problem seem hard, or what you might be doing wrong. This can lead to better ways to represent the problem. Contradiction. Try to prove that your problem cannot be solved, and then look for a flaw in that argument. Use external representations: If you find that youвЂ™re losing track of details, you can resort to keeping records and notes, or drawing suitable diagrams. Simulation. One can avoid taking physical risks if one can predict вЂњwhat would happen ifвЂќ by imagining possible actions inside the mental models that one has built. Correlation. When certain events seem to happen together, try to find ways in which they may be connected. Logical Reasoning. We sometimes make вЂ�logical chains of deductions,вЂ™ but those conclusions may be wrong because of exceptions to our assumptions. Wishful thinking. Imagine having unlimited time and all the resources that you might want. If you still canвЂ™t envision solving the problem, then you should reformulate it. Impersonation. When your own ideas seem inadequate, imagine someone better at this, and try to do what that person would do. Resignation. Whenever you find yourself totally stuck, you can shut down the resources youвЂ™re using now and relax, lay back, drop out, and stop. Then the вЂ�Rest of Your MindвЂ™ may find an alternativeвЂ”or conclude that you donвЂ™t have to do this at all. How do we choose which of these to use? The Critic-Selector model suggests that each person can recognize particular ways in which one gets stuckвЂ”and can use each such diagnosis to select one or more particular ways to deal with that kind of predicament. We each do this in different ways, and the Critics that we each develop must be among our most precious resources. В§7-5. What are some useful Critics? We are always developing new ways to thinkвЂ”so we also need to make Critics to help to select when to use each of those techniquesвЂ”by recognizing which kinds of problem we face. This means that our Critics must serve as ways to classify all the barriers, obstacles, impasses, or snags that make our problems hard to solve. Indeed, it would be an important goal, both for people and for computing machines, to have a systematic catalog of the types of problems we most frequently face. However, we do not yet have adequate, orderly ways to do thisвЂ”so here weвЂ™ll merely try to describe a few types of Critics that people seem to use. Innate Reactions and built-in Alarms. Many types of external events arouse detectors that make us quickly react, as when an object is quickly approaching you, a light is too bright, you touch something hot, or hear a loud sound. WeвЂ™re also born with ways to detect abnormal conditions inside our skinsвЂ”such as wrong levels of chemicals in the blood. Many of these have built-in connections that make us react to correct those conditions, in ways that work so automatically that we react to them without any thought. However, an unexpected touch, sight, or smellвЂ”or a sense of hunger, fatigue, or painвЂ”does interrupt the flow of our thoughts. Indeed weвЂ™d never survive through our infancies unless such emergencies (or opportunities) could pull us away from our reveries. We can sometimes suppress some of those alarms; for example, when we suppress a sneeze, or stop ourselves from scratching an itch. But if you try to hold your breath, you canвЂ™t resist the alarm of asphyxiaвЂ”and it is hard to ignore a babyвЂ™s cry, a constantly ringing telephone, or an amorous opportunity. Learned Reactive Critics. An infant will cry when it is exposed to high levels of noiseвЂ”thus summoning a parent to help. However, later we learn other ways to react, such as moving to a quieter place. And eventually we learn to вЂ�figure outвЂ™ ways to deal with more difficult obstaclesвЂ”by using higher levels of what we call вЂ�deliberativeвЂ™ thinking and then it would seem to make more sense to think of these as involving our Critics. Reflective Critics. When you try to solve problems by trial and error, you need critics as вЂ�diagnosticiansвЂ™ to either verify that youвЂ™re making progress or to suggest a better way to proceed. I should note that we often say вЂњCriticвЂќ to mean someone who points out deficiencies, and it would be hard to describe the Correctors, Suppressors and Censors [В§3-5] without using negative words like inhibit, prevent, or terminate. However, words like positive and negative usually do not make sense by themselves; here, detecting a flaw can be and essential step toward helping one to achieve a successвЂ”for example, by keeping you from changing your goal or from wasting your time on other temptationsвЂ”and thus encouraging you to persist. Frequently, the key to solving a difficult problem can lie in finding ways to make yourself вЂ�stick to a planвЂ™, although it may bring some suffering before you achieve your longer-range goal. What we learn can be more profound, if we assign the credit for our success, not to the final act itselfвЂ”or even to the strategy that led to itвЂ”but to some even earlier choice of a process or plan that selected the winning strategy. William James: вЂњOur natural way of thinking about ... emotions is that the mental perception of some facts excites the mental affection called the emotion, and that this latter state of mind gives rise to the bodily expression. My theory, on the contrary, is that the bodily changes follow directly the perception of the exciting fact, and that our feeling of the same changes as they occur is the emotion." William James: If we fancy some strong emotion and then try to abstract from our consciousness of it all the feelings of its bodily symptoms we find we have nothing left behind, no вЂњmind stuffвЂќ out of which the emotion can be constituted, and that a cold and neutral state of intellectual perception is all that remains. вЂ¦ [I cannot imagine] what kind of an emotion of fear would be left if the feeling neither of quickened heart beats nor of shallow breathing, neither of trembling lips nor of weakened limbs, neither of goose flesh nor of visceral stirrings, were present. ... Can one fancy the state of rage and picture no ebullition in the chest, no flushing of the face, no dilation of the nostrils, no clenching of the teeth, no impulse to vigorous action, but in their stead limp muscles, calm breathing, and a placid face. Student: But then, why should your body react to them at all? The expressions of rage that James depicts (including that clenching of teeth and flushing of face) could have served in primordial times to help to repel or intimidate the person or creature that one is angry with; indeed, any external expression of oneвЂ™s mental state can affect how someone else will think. This suggest an idea about what we mean when we use our most common emotion words; they refer to classes of mental conditions that produce external signs which make our behaviors more predictable to the persons with whom we are dealing. Thus for our ancestors, those bodily signs served as useful ways to communicate such so-called вЂ�primaryвЂ™ emotions as anger, fear, sadness, disgust, surprise, curiosity, and joy. Student: Perhaps this could also be because our most common emotions evolved long ago when our brains were simpler. Then there were fewer levels between our goals and our sensory-motor systems. The body and face could also serve as a simple sort of memory: those states of mind might soon fade awayвЂ”except that those body-expressions could help to maintain them by sending signals back to the brain. In that respect, William James might be right: without such вЂ�mind-bodyвЂ™ feedback loops, those вЂ�cold and neutralвЂ™ mental states might not persist for long enough to grow into larger-scale cascades. For your external expressions of anger serve not only to frighten your enemies, but also ensure that you will stay frightened for long enough to carry out some actions that might save your life. For example, your face might display an expression of horrorвЂ”even when no one else is presentвЂ”when you realize that you left the door unlocked, or forgot to turn the oven off, or that something that you believed was false. After all, you need your body to stay alive, so, given that it is always at hand, it makes sense for your brain to exploit it as a dependable external memory device. When we are young, we find it hard to suppress those external expressions, but eventually we learn to control most of them, to at least some degree, so that our neighbors canвЂ™t always see how we feel. Student: If those physical symptoms are not essential parts of emotions, then how can we make a distinction between our emotional states and our other ways to think? Aristotle: The emotions are all those feelings that so change men as to affect their judgments, and that are also attended by pain or pleasure. вЂ”Rhetoric, Book II. In a modern version of this, some psychologists talk about вЂ�Valence,вЂ™ which refers to the extent to which oneвЂ™s attitude toward some thing or situation is generally positive or negative. Similarly, there is a popular view in which we think of emotion and thoughts as complementary, in much the same way that an objectвЂ™s color and shape can change independently; we thus can think of each object (or idea) as having various вЂ�matter of factвЂ™ or neutral aspects that, somehow, are also вЂ�coloredвЂ™ by additional characteristics that seem to make it attractive, exciting, or desirableвЂ”versus disgusting, dull, or repulsive. More generally, our language and thoughts are filled with distinctions like вЂ�positive vs. negativeвЂ™ and вЂ�rational vs. emotional. Such pairs are so useful in every day life that itвЂ™s hard to imagine replacing them (any more than we should discard the idea that the sun rises and sets each day and night, because this is technically incorrect). However, if our goal is to understand our minds, weвЂ™ll have to outgrow many dumbbell ideas. In particular, exaggerating the bodyвЂ™s role in emotions can lead to serious misconceptions. Do the talents of pianists reside in their fingers? Do artists see with talented eyes? No: there is no evidence to suggest that any of those body-parts think; itвЂ™s the brain that sits in the driverвЂ™s seat. Ask Steven Hawking or Christopher Reeve. Sometimes youвЂ™ll work on a problem for hours or days, as when Joan worked on her progress report. She has been thinking about it for several days, but has not yet conceived of a good enough plan. Discouraged, she sets those thoughts aside вЂ¦ but then an idea вЂ�occursвЂ™ to her. But did Joan really set those thoughts aside, or did they continue in other parts of her mind? Hear a great mathematician recount some similar experiences. This suggests that the work was still being pursued, hidden away in вЂ�the back of his mindвЂ™вЂ”until suddenly, as though вЂ�out of the blue,вЂ™ a good solution вЂ�occurredвЂ™ to him. вЂњThere was one [obstacle] however that still held out, whose fall would involve the whole structure. But all my efforts only served at first the better to show me the difficulty. вЂ¦ [Some days later,] going along the street, the solution of the difficulty that had stopped me suddenly appeared to me. вЂ¦ I had all the elements and had only to arrange them and put them together." Preparation: Activate resources to deal with this particular type of problem. Incubation: generate many potential solutions. Revelation: recognize a promising one. Evaluation: verify that it actually works. LetвЂ™s consider what might be involved in each of the stages of such a process. вЂњThis creative power works with elements, with materials; what if it has not those materials, those elements, ready for its use? In that case it must surely wait till they are ready. "вЂ”Essays in Criticism, 1865. Incubation: Once the вЂ�unconscious mindвЂ™ is prepared, it can consider large numbers of combinations, searching for ways to assemble those fragments to satisfy the required relations. Poincare wonders whether we do this with a very large but thoughtless searchвЂ”or if it is done more cleverly. Poincare: вЂњIf the sterile combinations do not even present themselves to the mind of the inventor вЂ¦ does it follow that the subliminal self, having divined by a delicate intuition that [only certain] combinations would be useful, has formed only these, or has it rather formed many others which were lacking in interest and have remained unconscious?" In other words, Poincare asks how selective are our unconscious thoughts; do we explore massive number of combinations, or work on the finer details of fewer ones? In either case, when we incubate, we will need to switch off enough of our usual Critics to make sure that the system will not reject too many hypotheses. However, we still know almost nothing about how our brains could conduct such a search, nor why some people are so much better at this: here is one conjecture about that. Revelation: When should incubation end? Poincare suggests that it continues until some structure is formed "whose elements are so harmoniously disposed that the mind can embrace their totality while realizing the details." But how does that subliminal process know when it has found a promising prospect? He conjectures that this ability to detect promising patterns seems to involve such elements as symmetry and consistency. Poincare did not say much more about how those detectors of вЂ�eleganceвЂ™ might work, so we need more ideas about how we recognize those signs of success. Some of those candidates could be screened with simple matching tricks. Also, as part of the Preparation phase, we select some specialized critics that can detect progress toward solving our problem, and keep these active throughout Incubation. Poincare: вЂњI have spoken of the feeling of absolute certitude accompanying the inspiration ... but often this feeling deceives us without being any the less vivid, and we only find it out when we seek to put on foot the demonstrations. I have especially noticed this fact in regard to ideas coming to me in the morning or evening in bed while in a self-hypnagogic state." In other words, the unconscious mind can make foolish mistakes. Indeed, later Poincare goes on to argue suggest that it often fails to work out the small detailsвЂ”so when Revelation suggest a solution, your Evaluation may find it defective. However, if it is only partially wrong, you may not need to start over again; by using more careful deliberation, you may able to repair the incorrect part, without changing the rest of that partial solution. I find PoincareвЂ™s scheme very plausible, but surely we also use other techniques. However, many thinkers have maintained that the process of creative thinking cannot be explained in any way, because they find it hard to believe that powerful, novel insights could result from mechanical processesвЂ”and hence require additional, magical talents. However, Chapter 8 will argue that outstanding abilities can result from nothing more than fortunate combinations of certain traits that we find in the ways that most people think. If so, then what we call вЂ�geniusвЂ™ requires no other special ingredient. 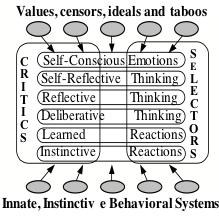 Somewhat similar models of thinking were proposed in Hadamard (1945), Koestler (1964), Miller (1960), and Newell and Simon (1972)вЂ”the latter two in more computational terms. Perhaps the most extensive study of ways to generate ideas is that of Patrick Gunkel at http://ideonomy.mit.edu. In any case, however you make each new idea, you must quickly proceed to evaluate by activating appropriate critics. Then, if the result still has some defects, you can apply similar cycles to each of those deficiencies. In my view, what we call вЂ�creativityвЂ™ is not the ability to generate completely novel concepts or points of view; for a new idea to be useful to us, we must be able to combine it with the knowledge and skills we already possessвЂ”so it must not be too very different enough from the ideas weвЂ™re already familiar with. For many people, thinking and learning is largely a social activityвЂ”and many of the ideas in this book came from collaborations with students and friends. Some such relationships are productive because they combine different sets of aptitudes. However, there also are pairs of partners who have relatively similar skillsвЂ”perhaps the most important of which are effective tricks for preventing each other from getting stuck. Do we normally think 'Bipolarly'? The processes that Poincare described involved cycles of searching and testing in which problems are solved over hours, days, or even years. However, many events of everyday thinking persist for just a few seconds or less. Perhaps these, too, begin by spawning ideas, then selecting some promising ones, and then dwelling on their deficiencies! If so, then a typical moment of commonsense thinking might begin with a very brief вЂ�micro-manicвЂ™ phase. This would produce an idea or twoвЂ”and then a short вЂ�micro-depressiveвЂ™ phase would quickly look for flaws in them. If those phases took place so rapidly that your reflective systems donвЂ™t notice them, then each such micro-cycleвЂ™ would seem to be no more than a moment of everyday thinking, while the overall process would seem to you like a steady, smooth, uneventful flow. The quality of such systems would depend in part on how much time one spends in each such phase. It seems plausible to conjecture that, when one is inclined to be вЂ�criticalвЂ™ or вЂ�skeptical,вЂ™ one spends less time at Incubation and puts more effort into Evaluation. However, if anything were to go badly wrong with how those durations were controlled, then some of those phases might last for so long that (as suggested in В§3-5) they might appear as symptoms of a so-called вЂ�manic-depressiveвЂ™ disorder. The Selectors and Critics that were involved. This means that our larger-scale model of mind needs places for keeping such sets of records. LetвЂ™s give these the name of вЂњCognitive Contexts.вЂќ Without them, every вЂ�train of thoughtвЂ™ would be disrupted whenever we were interrupted. In simpler brains, it might suffice to maintain no more than a single such memory, but for looking several steps aheadвЂ”or for managing larger subgoal treesвЂ”weвЂ™d need special machinery to enable us to rapidly switch among several remembered contexts. More generally, because every hard problem keeps forcing us to switch among several different Ways to Think, a typical вЂ�present mental stateвЂ™ must actually be part of a larger panalogy that can fluently navigate among several different points of view. In popular folk-psychology, we simply imagine all that stuff to be stored in our вЂњshort-term memoriesвЂќвЂ” as though we could put such things into a box and take them out whenever we want. Her current collection of sub-goal trees. Some records of recent external events. Simulations she uses to make her predictions. Why would we need special systems like this to keep track of multiple contexts? It seems quite natural to us that after any brief interruptionвЂ”for example, to answer a question that someone has asked, or to pick up a tool that you have just droppedвЂ”we can usually get back to what we were doing without needing to start all over again. It is the same when we interrupt ourselvesвЂ”for example, to attend to a subgoal of a task, or briefly to think in some different way. When such a diversion is small and brief, this causes little trouble because it leaves most of our active resources unchanged. How long do recent records persist, and how do we make room for new ones? There must be more than one answer to that because various parts of the brain must work in somewhat different ways. Some memories may be permanent, while others may rapidly fade away, unless they happen to get вЂњrefreshed.вЂќ Such records also would get erased if stored in a вЂ�placeвЂ™ that has a limited sizeвЂ”because then each new item would have to replace some records that are already there. Indeed, this is how modern computers work: whenever data is created or retrieved, it is first stored in a cacheвЂ”a device that has been designed to be especially quickly accessible. Then, whenever such a cache gets full, its oldest records get erasedвЂ”although some of them may have been copied to larger, more permanent memory boxes. How do some memories become permanent? There is evidence that it takes hours or days for what we call short-term memories to be converted to longer-term ones. Older theories about this assumed that frequent repetitions made the original record more permanent. However, it seems more likely to me that new memories are briefly maintained in resources that act like a computerвЂ™s cacheвЂ”and then, over time, more permanent versions are created in other regions of our brains. See В§8-4. St. Augustine: вЂњBut what happens when the memory itself loses something, as when we forget anything and try to recall it? вЂ¦ Perhaps the whole of it had not slipped out of memory; but a part was retained by which the other lost part was sought for, because the memory realized that it was not working so smoothly as usual, hence, it demanded the restoration of what was missing. For example, suppose we see or think of some man we know, and, having forgotten his name, try to recall itвЂ”but some other thing presents itself, which was not previously associated with him; then this is rejected, until something comes into the mind which better conforms with our knowledge.вЂќвЂ”Book 10 of Confessions, 427 AD. Augustine soon turned to other concerns, and concluded this discussion of memory by plaintively asking, вЂњWho will work this out in the future?вЂќ But more than a thousand years were to pass before further progress on theories of memories. How many thoughts can you think at once? How many feelings can you feel at once? How many different things can you simultaneously вЂ�pay attentionвЂ™ to? 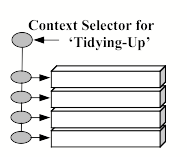 How many contexts can be active at once in your context-box? To what extent can you be aware of how many mental activities? Your grasping resources keep hold of the cup. Your balancing systems keep the liquid from spilling. Your visual systems recognize things in your path. Your locomotion systems steer you around those obstacles. It is much the same with language and speech. You rarely have even the faintest sense of what selects your normal response to the words of your friends, or which ideas you choose to expressвЂ”nor of how any of your processes work to group your words into phrases so that each gets smoothly connected to the next. All this seems so simple and natural that you never wonder how your context-box keeps track of what you have already saidвЂ”as well as to whom you have mentioned them. What limits the number of contexts that a person can quickly turn on and off? One very simple theory would be that our context-box has a limited size, so there is only a certain amount of room in which to store such information. A better conjecture would be that each of our well-developed realms acquires a context box of its own. Then, some processes in each of those realms could do work on their own, without getting into conflicts until when they have to compete for the same resources. For example, itвЂ™s easy to both walk and talk because these use such different sets of resources. However, it is much harder to both speak and write (or to listen and read) simultaneously, because both tasks will compete for the same language-resources. I suspect such conflicts get even worse when you think about what youвЂ™re thinking about, because every such act will change what is in the context box that keeps track of what you were thinking about. At our higher Reflective levels, our representations span many scales of time and space, and our current Self-Representations can range from thinking "I'm holding this cup" to вЂњI am a Mathematician," or вЂњI am a person who lives on the Earth,вЂ™ or sometimes, perhaps, only a little more than a constant, vague sense of вЂ�being aware.вЂ™ To be sure, a person may also have the impression of thinking all these simultaneously, but I suspect that these are constantly shifting; our sense of thinking them all at once comes from the вЂњImmanence IllusionвЂќ of В§4-1, because the contents of our various Context-Boxes are so rapidly accessible. What Controls the Persistence of Processes? Edmund Burke: вЂњHe that wrestles with us strengthens our nerves and sharpens our skill. Our antagonist is our helper. This amicable conflict with difficulty obliges us to an intimate acquaintance with our object and compels us to consider it in all its relations. It will not suffer us to be superficial.вЂќ вЂ”Reflections on the Revolution in France, 1790. Citizen: But certain, well-disciplined persons seem able to set such emotional feelings aside, and simply do what seems вЂњrational.вЂќ Why do most of us people find this so hard to do? It seems to me that it is a myth that there exists a вЂ�rationalвЂ™ way to think. One is always comparing various goals, and deciding which ones to put aside, but the apparent merits of those alternatives will always depend on other aspects of your mental state. In any case, each Way to Think will be useless unless can persist for long enough to make some progress. To do this, it will need at least some ability to keep other processes from stopping it, and this could be done to some extent by controlling which of your Critics are working now. LetвЂ™s consider a few extremes of this. What if some Critics stay on all the time? Certain Critics must always be active to make us react to serious hazardsвЂ”but if these are not selected carefully, it could lead to obsessive behaviors by repeatedly making you focus too sharply only on certain particular subjects. What if all your Critics get turned off? Then all your questions would seem to be answered because you are no longer able to ask them, and all your problems would seem to be gone because nothing seems to have any flaws. Everything may seem wonderful during such a вЂ�mystical experienceвЂ™вЂ”but such вЂ�revelationsвЂ™ usually fade when enough of your critics get turned back on. What if too many Critics are active at once? Then youвЂ™d keep noticing flaws to correct, and spend so much time repairing them that you would never get any important things done. And if you find ugliness everywhere, your friends may perceive you as depressed. What if too many Critics are turned off? If you can ignore most alarms and concerns, that would help you to вЂ�concentrateвЂ™вЂ”but it also might lead you to ignore errors and flaws in your arguments. However, the fewer Critics you activate, the fewer goals you will try to pursue, and then you would tend to be mentally dull. Then what should decide which ones are active? Your thinking would become chaotic if too many goals were to freely compete without any larger-scale managementвЂ”but if and particular Way to Think persisted too long, you would appear to have a вЂ�one-trackвЂ™ mind. Chapter В§9 will argue that control over which of our Critics are active must never be too highly centralized, because sometimes we need to concentrateвЂ”yet still respond to emergencies. Also, consider what might happen if large classes of Critics turned off, and then on, for excessive durations of time: then there would be long cycles in which you would first be euphoric, when nothing would ever seem to be wrong, followed by intervals in which no goal would seem to be worth pursuing. In such cases, the Critics that normally help us to think could play a role, when theyвЂ™re poorly controlled, in what we call manic-depressive disorders. Which of our ways to think are inborn? Which of them are not innate, but are ones that each child eventually learns from its experience with its environment? Then do certain individuals go on to discover special techniques that lead them to yet better ways to think? WeвЂ™ll discuss this in В§8-8 Genius. What determines the urgencies of our goals? What keeps track of the tasks that we have postponed? Are there clocks or timers in our brains that schedule or otherwise regulate our higher-level activities? WeвЂ™ll talk about this in Chapter В§9. How many things can we think about at once, and in how many different realms? How many different contexts can we manage to keep active? How are such activities distributed among the billions of cells in our brains? How does Context affect how we think? WeвЂ™ll come back to this in Chapter В§10. Logic can be useful after a problem is solved, for making credit assignments [В§8.5] and for solving simplified versions of problems. See В§В§Logic. See Ortony, A., Clore, G.L., Collins, A., The Cognitive Structure of the Emotions, New York, Cambridge University Press (1988). These quotations are from Poincare 1908. The Foundations of Science, 1982, ISBN: 0819123188. In comp.ai.philosophy, Nov 20 1995. Some theorists question the existence of вЂ”this sort of unconscious processing. Paul Plsek discusses this issue at length: вЂњSome experts dismiss the notion that creativity can be described as a sequence of steps in a model. For example, Vinacke (1953) is adamant that creative thinking in the arts does not follow a model [and] Gestalt philosophers like Wertheimer assert that the process of creative thinking вЂ¦ does not lend itself to the segmentation implied by the steps of a model. But while such views are strongly held, they are in the minority. вЂ¦ In contrast to the prominent role that some models give to subconscious processes, Perkins (1981) argues that subconscious mental processes are behind all thinking and, therefore, play no extraordinary role in creative thinking.вЂќвЂ”Paul E. Plsek in www.directedcreativity.com/pages/WPModels.html Ask him at paulplsek@directedcreativity.com: See also Perkins, DN (1981) The Mind's Best Work. Cambridge, MA: Harvard University Press; Vinacke, WE (1953) The Psychology of Thinking. New York: McGraw Hill; and Wertheimer, M (1945) Productive Thinking. New York: Harper. This could be related to why some brain waves become irregular when our thinking encounters obstacles. This figure includes the names of some current ideas about how such records are represented. One can see descriptions of some of these schemes by searching the Web with keywords like working memory, short-term memory, and global workspace. The ideas of Bernard Baars (see http://www.imprint.co.uk/online/baars.html) seem especially relevant to me. The construction of long-term memories appears to involve special kinds of sleep, in ways that are not yet understood. It also appears that different kinds of memories (e.g., about autobiographical events, about other kinds of episodes, about what are called вЂ�declarativeвЂ™ facts, and about perceptual and motor events) are each stored in somewhat different ways and in different locations in the brain. Section 19.10 of The Society of Mind described a scheme called вЂњClosing the RingвЂќ that could help to re-connect some of the parts that were not at first retrieved.